Rainfall and runoff energy results in soil erosion. This paper presents new the concepts of rainfall and runoff energy and analyzes the relationship of rainfall energy and runoff energy with sediment transport based on the conversion theory of kinetic and potential energy using artificial rainfall and mechanical calculation. The results show that the ratio of sediment detachment in sloping fallow overland flow increases with the slope gradient, rainfall energy and runoff energy, while the sediment detachment ratio under raindrop impact are significantly higher than those under no raindrop impact. The sediment concentration increases with the slope gradient and rainfall energy; when the slope gradient and rainfall energy are constant, the sediment concentration decreases as the runoff energy increases. Rainfall disturbance coefficients have a logarithmic correlation with the rate of rainfall energy and runoff energy. On the same slope gradient, when the rainfall energy is constant, the disturbance coefficient decreases as the runoff energy increases, while when the runoff energy is constant, the disturbance coefficient increases as the rainfall energy increases. Rainfall energy results in sediment detachment, and runoff energy is the transportation for erosion sediment. This showed that rainfall energy and runoff energy are important in the sediment detachment and transportation of shallow overland flow. The authors thank the anonymous reviewers for their insightful comments on the original manuscript. 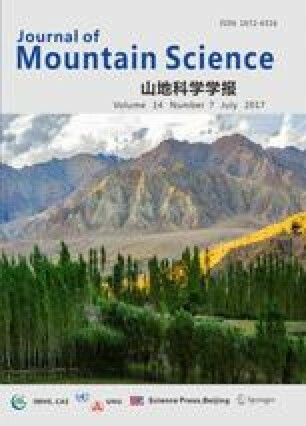 This research was supported by the National Natural Science Foundation of China (41571262) and the Chinese Ministry of Water Resources Science and Technology Promotion Program (TG1308).